The manifesting and disappearing ghosts in the grand ballroom of Disneyland's Haunted Mansion aren't holograms or digital projections. They're based on Pepper's Ghost, a nineteenth century technique that, until the Haunted Mansion was constructed, had never been used on such a grand scale. This is Part Two of our excerpt series from The Unauthorized Story of Walt Disney's Haunted Mansion, by Jeff Baham, published by Theme Park Press, and reprinted here with permission. Check out the first excerpt here . The Pepper's Ghost effect essentially combines two scenes into one by forcing the viewer to see a superimposed image through reflection. In the case of the Haunted Mansion ballroom , the Doom Buggy track runs directly between the two sets. The carriages face a giant sheet of plate glass, through which guests view the scenery and props from above, peering down into the set. Below and behind the Doom Buggies, the appearing and disappearing "ghosts" are placed into a second blackened set in a mirrored position relative to where they are to appear interspersed with the scenery and props. As they are illuminated, their reflections in the glass seem to interact with the scenery in the ballroom set. Illusion alone cannot make a mundane set convincing. So the Haunted Mansion is packed to the brim with detail, atmosphere, and Audio-Animatronics. Veteran Imagineer Bill Justice, another Disney animator pulled into WED, was charged with bringing the robotics to life. "Bill could be considered the conjurer of the group," said Imagineer David Mumford. "He programmed all the lively 'corpses' that inhabit the ghostly Mansion." The design of many animated figures begins with what is called the base frame. It is the foundation upon which the visible figure is mounted, and it's also a location for various working parts that bring the figure alive, including hydraulic and pneumatic distribution hardware, actuators, and other hardware that contributes to the working of the animatronic figure. There are four large rotating turntables in the banquet hall, and another one in the graveyard. There are two turntables in the banquet scene, with three dancing couples on each turntable. There is also the "visitors" turntable with the figures horizontally rotating in a circle. From the ride, these all reflect off the glass to make it look like they are floating in and out of the door that is open with the hearse in it. The overhead "banshee" turntable has several horizontal figures rotating on it, and it gives the effect of ghosts floating in and out of the blowing curtains window. There is also a "skull wheel" that rotates over the organist, and this, too, is a motor driven mechanism. After passing over the ballroom's balcony, the Doom Buggies carry the patrons through a dark doorway into a musty, neglected attic. When the Haunted Mansion first opened, early riders report that thread-like "cobwebs" hung from the ceiling, brushing against guests' faces, though this effect has long been lost to history. Dust covers all sorts of old remnants of the Haunted Mansion's mortal owners' previous lives. 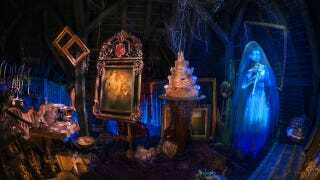 Trunks, statues, paintings, and lamps are strewn about, and the Doom Buggies spin their way through the clutter. Prior to 2005, the attic scene could be described as follows: Permeating the darkness, a human-sounding heartbeat throbs through the dusty air. Meanwhile, ghastly spooks pop up from behind trunks and out of chests with screeches and shrieks, frightening the occasional patron caught unaware. Finally rounding a corner that will lead the Doom Buggy out a window and to freedom from the Haunted Mansion's spooks, patrons are brought face-to-face with the source of the rhythmic beating: a plaintive bride, her pale hand clutching a flickering candle, and her face hidden in the shadows except for the glowing embers of her eyes. Slowly holding up her candle, she balefully watches as the Doom Buggy passes her by and heads toward the open attic window. In 1969, when the Disneyland Haunted Mansion first opened, there was an additional character in the attic: a spooky old Hat Box Ghost who stood across and down the track from the bride, near the attic window. The Hat Box Ghost was an ambitious, close-up special effect that was supposed to make the bony, elderly ghost's skull-like head disappear and then reappear in the hat box he was toting in one claw- like hand, while the other hand quivered on an old cane. Designed by Yale Gracey (with character concepts contributed by Marc Davis), the effect relied on lighting to illuminate the "real" head, and then extinguish as another light illuminated the "hat box" head, creating the illusion that the head was vanishing from the first position and reappearing in the second. While the concept was inspired, the execution wasn't as effective as the WED engineers had hoped, and Marc Davis himself made the call to pull the effect from the attraction, according to Imagineer Wayne Jackson, who both built the figure and then had to remove it. In the short term, the ride was better without a misfiring effect, despite the fact that the character has since taken on a cult following. But, as Davis would like to say, "Do you want the truth, or do you want to feel good?" "Unfortunately, this ghost had some troubles with his hocus pocus," quipped Imagineer David Mumford.5 Though the effect wasn't in place for long, some veteran Haunted Mansion fans remember seeing it in place in the first days of the Haunted Mansion's operation back in 1969, and both a grainy home movie and a snapshot photograph have been discovered of the animatronic, proving that it did exist, though quite briefly. During a 1995 "ride rehab," a process that takes place every few years in which a Disney theme park attraction is closed for a period of time and reviewed with a fine-toothed comb, the Disneyland attic scene was updated to tell more of a story. A piano was added to the attic, with a projected animated shadow of a cloaked pianist pounding the keys, which are playing themselves. The invisible pianist played the Bridal Chorus in a minor key. The entire set was re-themed to make the bride more of a centerpiece. The pop-up ghosts were re-dressed in top hats and black bow ties, and instead of screeching, they began to shout "I do!" in ominous tones. The bride herself was spruced up as well, with her face painted to show a little more detail, her gown gussied up with fancier lace, her hair lengthened, and, at Walt Disney World, expanded to form a crazy, wavy halo of spectral style. Both Walt Disney World's and Disneyland's brides received makeovers, to mixed reviews. Fans positioned behind and below the animatronics made the brides' gowns and hair billow in the darkness. A hydraulic support was also added underneath the figure, making the bride appear to be floating. Whirling bats across from the bride added even more motion to the scene. Despite the variety of ways the attic has changed over the years, the bride has remained the mysterious heart of the Haunted Mansion attraction, partly due to her confounding presence, and partly due to Ken Anderson's tales that have existed since the attraction was on the drawing board back in the 1950s. In Storyboard Magazine, X. Atencio makes the point: "The storyline was supposed to be about a bride who died, so they have an illusion of a bride in a bridal costume, her heart thumping away. The bride beckons with a flickering candle as her heart pounds loudly, glowing the color of blood." In 2006, the attic scene was revisited again, and revised significantly. The bride was given a name, a sharp-witted new persona—and a sharp-edged weapon, as well. Now named Constance, the bride seems to have taken up residence in the attic, displaying souvenirs from her numerous trips down the altar—all of which seem to have ended in tragedy. The bride was removed from her perch near the attic window (which itself was the perch originally assigned to the short-lived Hatbox Ghost), and she now appears in the opposite corner of the attic; a glowing spectral form with her veil and draping gown billowing in a ghostly breeze. Rather than being a 1960s-era Audio-Animatronic as was the original bride, Constance takes after Madame Leota and the singing busts from the graveyard by showing her lively side via projected footage. This new bride—by turns comical and menacing—offers pithy comments to guests as they pass through the attic, such as "In sickness, and in wealth," or "'Til death do us part," as she raises and lowers a gleaming hatchet that appears out of thin air, then disappears again. While much of Constance's story is left to the imagination, there are some hints in the newly-packed attic that give guests insight into the character. A series of wedding portraits are displayed among the various wedding gifts and ceremonial trappings scattered throughout the attic—and as guests pass each photo, the heads of Constance's former grooms disappear from each portrait, and then reappear again. In one photograph, Constance holds a rose while posing next to a groom named George, echoing one of the stretching portraits at the beginning of the ride that portrays a widow holding a rose as she stands over the grave of her dearly departed husband George, whose headstone has been hacked at with a hatchet. In 2007, the Walt Disney World Haunted Mansion underwent a major rehab, and Constance was added to the attic scene there as well. The voice of Constance (who is also known by Imagineering as the "Black Widow Bride") was performed by Disney voice-over artist Kat Cressida. Cressida's performance was also utilized for the creation of the projected image, though there is some considerable digital effects work involved with the final product. A high-definition video projection onto a static form with practical blowing veils completes the effect, which is incredible to watch, and adds a new layer of menace to the story of the Haunted Mansion. The actress who portrays Constance in her earlier days as a young bride in the various wedding portraits scattered throughout the attic is Julia Lee. In addition to her contributions to the Haunted Mansion's attic, Lee has also appeared on Buffy the Vampire Slayer and in small roles in feature films. For her part, Cressida is proud of the character she has brought to life. "[The Imagineers] wanted Constance to seamlessly fit in with the mythology and the feel of the Haunted Mansion...not to feel like something that had never been there before," she said. "Maybe you would go through [the ride] and say, 'Was that always here? 'Cause that was really cool!'" The spot where the Hat Box Ghost once stood at the attic window through which the Doom Buggies make their escape has been covered over with attic junk, but remains essentially vacant. Perhaps, someday, a long-lost resident of the attic might find his way back to his former home...or at least, his fans can always hope. Jeff Baham runs the popular site doombuggies.com, the leading resource about the Haunted Mansion. He has sat on the Disneyland Creative Advisory Council, and contributed to Disneyland Records' release of the Haunted Mansion's 40th Anniversary CD and Box Set.